Looking for a different Brady Bunch series? The Brady Bunch 1969 television sitcom focuses on Mike Brady, a widower with three sons, and Carol Martin, a widow with three daughters, who marry and set up housekeeping in a four-bedroom home in west Los Angeles. It's a sitcom family for the ages, with plenty of warmth and fuzziness (and constant fighting for the bathroom). 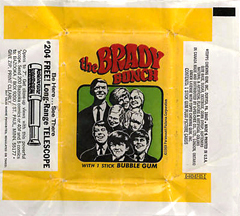 Topps produced The Brady Bunch 88 trading card set with color images from the Brady Bunch first TV season. The front of each card features a wood-grain background and a thick white border in the shape of a television screen. Each card has a color image from the sitcom of the Brady Bunch and a green caption box with a quote or description of the action. On the back side, each card is a piece of one of three puzzles: The Brady Bunch in a jail cell, Mike and Carol sharing a milkshake, and the Brady Bunch kids group picture. 12   	STUCK IN A STOCKADE! 14   	HERE COMES MY FASTBALL! 16   	BREAK IT UP! IT'S BEDTIME. 21   	MAKE UP FOR MARCIA! 23   	LONG DISTANCE PHONE CALL! 28   	SOMETIMES I HATE ICE CREAM! 30   	A COUPLE OF HUNGRY KIDS! 36   	UH-OH HERE COMES THE INDIANS! 38   	WHO USED MY TOOTHBRUSH? 52   	WHERE'S MY GREASY KID STUFF? 64	CAN I KEEP THE BIRD?